Members of #occupyjustice shall be meeting the Prime Minister on November 8 at 11am, saying they have been finally been given a formal appointment this afternoon a week after they asked for it. 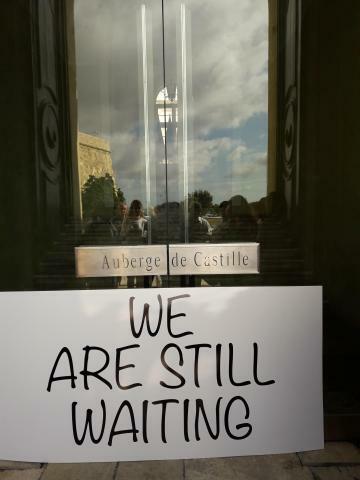 A group of women stood in front of Castille this morning for 45 minutes, as part of their campaign, insisting on the meeting tin the wake of Daphne Caruana Galizia's assassination. The women were holding up a banner saying "We are still waiting". The campaign, which started during last weekend's camp in front of Auberge de Castille, continued outside Parliament on Monday evening. The women are calling for justice following the journalist's murder on October 16, and are demanding the resignation of the police commissioner and the attorney general. As the activists were wrapping up the event, a communications officer from the OPM came out and asked two of the activists to wait for the Prime Minister for a private meeting, the organisers said. However, #occupyjustice insisted they wanted an official meeting, with a wider representation of the group present as well as the media, saying that what the group is requesting is "of interest to civil society as a whole who have lost faith in our institutions". "The office's invitation has not been forthcoming," they said. But in a statement this afternoon, the group said they have now finally been given their appointment. On Sunday, the Prime Minister said he was willing to meet #occupyjustice but so far has not been forthcoming with any date. A spokeswoman said: "#occupyjustice request to meet the Prime Minister was first sent last Thursday. We set up camp in front of the Office of the Prime Minister for four days. Hundreds of people from different walks of life joined our peaceful protest, but he did not even acknowledge our presence even though we were right on his doorstep. It's now been a week and we had to take this action to remind him that we won’t give up." The Civil Society Network in collaboration with Occupy Justice will be holding a sit-in protest on Sunday at 4pm in front of the Police Headquarters, Floriana. Those attending this peaceful protest are welcome to bring placards, banners, whistles, percussion and candles. The Office of the Prime Minister later issued a statement explaining that the Prime Minister was at the Mediteranean Conference Centre at the time of the protest this morning. A spokesman from his office went to inform them that he would be back at Castille within half an hour and that he was ready to meet the group immediately upon his return. The OPM said that the women replied that they could not wait as they had other commitments and asked that the meeting be scheduled to another day. But in their statement this afternoon, #occupyjustice said that despite earlier attempts at negative spinning, the intention of this morning's visit to the Prime Minister's office was to remind him that they were still waiting for his official invitation. "#occupyjustice was not after an ad hoc informal meeting with the Prime Minister and with only two #occupyjustice representatives present. We have always asked for, and issued several requests for, a formal meeting with the Prime Minister. It is also essential, for the sake of transparency, that the media is present throughout the meeting."